California GOP congressman Kevin McCarthy made headlines recently in a couple ways. First, he was next in line to replace John Boehner (pronounced bo-ner) as Speaker of the House. But upon seeing that he would somehow have to spend every waking moment trying to wrangle the Tea Party wingnuts, he decided to remove his name from consideration, thus throwing the House of Representatives into even more chaos. The second way, which was the cause of the aforementioned event, was that McCarthy showed his incompetence by opening admitting that the Benghazi hearings were nothing more than a political witch hunt on Hillary Clinton at the expense of the taxpayers money. So, seeing that he pretty much blew the Republican’s cover, he bowed out. A Benghazi whistleblower came forward last week pretty much saying the same thing as McCarthy, which brought forth the lead investigator of the Benghazi witch hunt, South Carolina GOP Congressman Trey Gowdy from his underground lair to denounce the whistleblower and McCarthy. Which in turn brought a surprise response from CNN denouncing Gowdy. What this all means is what most sane Americans have suspected all along. The Benghazi investigation is nothing but a political character assassination campaign by the GOP against Hillary Clinton in order to prevent her from being elected President. Now the teabagger Republicans in the House are going to start another witch hunt at the taxpayers expense investigating Hillary’s private e-mail server she kept as Secretary of State. If they want true justice, then they should also investigate former Secretary of State Colin Powell, who also relied on personal e-mails. While they’re at it, investigate all those e-mails that got erased from Dubya’s White House account back in 2007. Oh that’s right! We keep forgetting. It’s okay when Republicans do it. 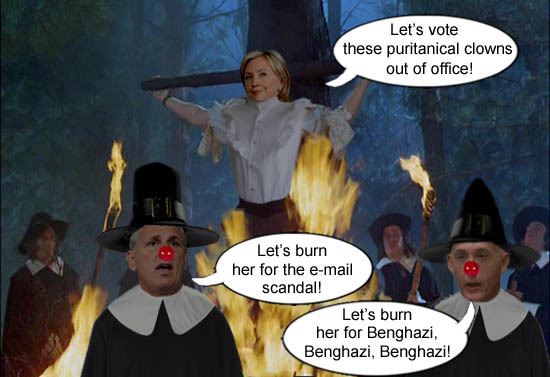 Puritanical clowns and GOP congressmen Kevin McCarthy and Trey Gowdy find a way to waste taxpayers money by conducting a political witch hunt on Hillary Clinton.